Walchem has introduced the WDP400 Series Dual Input pH/ORP controllers. 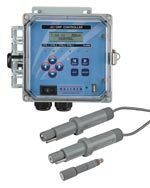 These controllers are designed for a broad range of industrial, commercial, and municipal water treatment applications. WDP controllers accept two electrode signals, in any combination of pH and ORP, and are offered in a convenient pre-wired NEMA 4X wall mount package that can be installed in minutes. The dual input model reduces space requirements. Integrated data logging is available to validate system performance. A USB stick is all that’s needed to extract data and event logs that include electrode measurements, temperature, accumulated chemical feed, and relay activation times.